ANDERS AT KYLE HOLLINGSWORTH'S HOPPY HOLIDAYS 2015! ANDERS AT BROOKLYN BOWL THIS DECEMBER! Anders is coming back to Brooklyn Bowl this December 11th and 12th! Anyone who came out last year knows what a great time these shows are with surprises and special guests. Tickets are on sale now HERE! Anders will be performing twice at THE LANDING FESTIVAL in New Orleans later this month! The first performance will be as a special guest at the festival pre party at Tipitina's on Friday September 25th. Only people who buy 3-Day passes to the festival will be able to attend this exclusive party at Tips! Get tickets HERE! The second performance will be with N.M.O. on Saturday September 26th at New Orleans' South Shore Harbor during the actual festival! Tickets, full line up, parking passes, food trucks and more info can be found at www.TheLandingFestival.com. See you there! This great video was filmed during this past year's Jazz Fest‬ at the House of Blues in New Orleans for Bandsintown. tickets for all shows here. Big thank you to all the amazing fans for coming out to the shows this tour! Thank you to promoters and venues, and a very special thanks to our crew for working so hard to make every show run smoothly and making it be such a success. The second leg of the North Mississippi Osborne tour is in full swing! Click here to check out photos featured on Relix from their show last Thursday at the Fillmore in San Francisco. Click here to see the rest of the N.M.O. tour dates and to see where Anders will be next. UPDATE: All paintings have sold! Thank to everyone who purchased them. Will hopefully have more up for sale soon! Anders has decided to put 6 more of his original paintings up for sale! These one of a kind pieces of art are made with acrylic and latex paint on reclaimed wood from around New Orleans. Last time he sold paintings they were all gone in less than a day. Go here for more details and purchasing information. Click here to listen to Anders and crew playing "Jealous Love" in Jamaica with Sonny Landreth sitting in. Be sure to catch Sonny with Anders again on February 13th at Tipitina's in New Orleans. Click here for Tickets to the show. N.M.O. SAN FRANCISCO DATE ANNOUNCED! Pleased to announce that Anders will be playing the Fillmore in San Francisco on April 2nd as part of the N.M.O. Tour! VIP presales are available now here and general admission tickets will go on sale this Sunday January 25 at 10am PST and will be available here. SONNY LANDRETH WITH ANDERS OSBORNE AT TIPITINA'S FRIDAY FEBRUARY 13TH! Pleased to announce that Sonny Landreth will be sitting in with Anders at Tipitina's! The Lost Bayou Ramblers will also be opening up the show. This is shaping up to be a good one- get tickets here! Anders Osborne's Christmas Spectacular from December of 2012 is now available for purchase here. Relive this epic night wtih this hi quality download. Over the course of the next week or so, the gang at "Anders Osborne World" (https://www.facebook.com/groups/andersosborneworld/) will be giving away a whole bunch of holiday gifts. Signed posters, setlists, shirts, download codes and more. Head on over, join the group, chat with other #TeamAO cats - and score yourself some cool AO stuff! Anders has teamed up with Native Orleanian Fine Photography's Jerry Moran to offer limited edition signed photos this holiday season. Go here to check out the selection and grab some exclusive photos signed by Anders himself. Also check out the Native Orleanian Fine Photography facebook page here. Tickets for the Dead Feat shows on April 25th and 26th 2015 are on sale NOW. These will sell out well in advance- click here to go pick some up before they're all gone. See you at Tipitina's this weekend! Anders featured on Effects Bay! Ever wonder what type of effects pedals Anders uses to get his signature guitar tones? Head here to check out a feature on Anders’ pedal board. The folks over at the Effects Bay have given us a detailed break down of all of the different pedals that Anders uses on a nightly basis. Very cool write up for any of you guitar players out there. Preview of Anders live at Tipitina's Night Two! As y'all probably know by now, we got the first night of the 2nd Annual Holiday Spectacular available for download (http://bit.ly/2ndAOTipsNight2). Wanna take a listen to the second night? Here's almost-14-minutes of "Stoned, Drunk and Naked" with our great friends Mark Mullins, Johnny Sansone and Tim Green (RIP that lovely soul). Anders Osborne Holiday Spectacular Special Guests Announced! We are very pleased to announce the guests for the third annual Anders Osborne Holiday Spectacular at Tipitina’s in New Orleans. This is a pretty incredible line-up and these shows are not to be missed. On Friday we’ve got Stanton Moore from Galactic, Dave Hidalgo from Los Lobos and Joe Cabral from The Iguanas. Saturday we have Tommy Malone from the Subdudes, Dave Malone from the Radiators, Marc Broussard and more special guests to be announced. Make sure you are a part of these legendary nights by picking up some tickets! Dead Feat at the Nola Jazzfest Series! Mark your Jazz Fest calendars, April 25th & 26th 2015. Bill Kreutzmann, Paul Barrere and Fred Tackett of Little Feat, Billy Iuso along with some guy named Anders - aka Dead Feat - are playing The Howlin Wolf New Orleans! Tickets go on sale Friday December 5th at 12pm CST. Last year's Dead Feat shows sold out in advance- Make sure you don't get shut out! Southern Soul Assembly Tour Kicks Off... NOW! Anders and Company start their Southern Soul Assembly Tour tonight in Sandpoint, Idaho! Check out this feature on the tour from Elmore Magazine and click here for all the upcoming shows. Anders is selling four of his own paintings to support the making of his new album "Spacedust And Ocean Views". Made with acrylic and latex, these one of a kind pieces were painted on pieces of wood from Anders' house! Click here to get a closer look at the paintings, and click here to check out the pledge campaign. We are extremely excited to announce that the 2nd Annual Anders Osborne Holiday Spectacular: Night 1 (12/6/13) is available for download. This multi-tracked, professionally mastered album is available in MP3 and lossless formats FLAC and ALAC. Click here to download now. So happy to be back in the studio again! Thanks again to our supporters for making this possible! We couldn’t be more excited to share our new tunes with ya’ll! Check out these shots from The Festy Experience 2014! The rain held off the and the audience was FANTASTIC! Thanks to Meredith Coe for the photos! Win Tickets & Signed Posters! Anders will be hitting the road soon with Southern Soul Assembly, alongside Luther Dickinson, Marc Broussard, and JJ Grey of JJ Grey & Mofro starting Nov. 11th. You can win tickets to any of their shows (and a signed poster) just by checking out their music and videos. Follow this link: http://tuns.pk/LgyAv9I and happy listening! 3rd Annual Nola Holiday Spectacular! 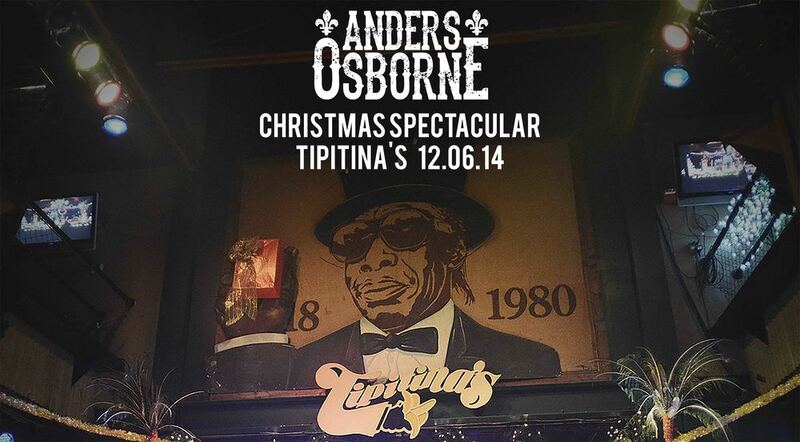 We are very excited to announce that Anders will be returning to Tipitina's for the 3rd Annual Holiday Spectacular! This year's very special shows will be on December 5th and 6th. VIP tickets are on sale now and they include a special VIP-only viewing area on the balcony, exclusive access to the pre-show soundcheck on Dec 5th and various other goodies. Visit http://bit.ly/PledgeAO to order yours now, they are limited in number and won't last long. Single and two-day passes will be available on Friday, September 26th at 11:00am (EST) via http://www.tipitinas.com/ See ya'll there! PledgeMusic Campaign- Pre-Order the New Record Today! We are excited to announce the Anders Osborne PledgeMusic campaign for the new record! Pre-Order the record now and check out all the other unique items we are offering. Anders will be going in the studio in October and the record will be out early next year. #NYC - Excited to announce that Anders Osborne is coming back in December for two headlining shows 12/12 & 12/13 at Brooklyn Bowl!! Pre-Sale Tickets on sale Tomorrow at 10 AM! Phases Of The Moon- Live Stream! Make sure to get your tickets to see Anders Osborne at Thalia Hall on Friday August, 7th. Excited to announce a special solo performance by Anders Osborne at City Winery Nashville, Friday Oct. 3rd! Make sure to head over to our Web Store and get a copy of "Coming Down". Now Available on Vinyl LP. The Southern Soul Assembly featuring Luther Dickinson, Anders Osborne, Marc Brossard and JJ Grey have announced a West Coast tour this fall traveling to 11 cities this November. This tour features four talented southern singer/songwriters who will join together to deliver a special evening filled with songs and stories together on one stage. The Southern Soul Assembly Tour pays tribute to the rich, authentic, and passionate southern legacy each player carries . “Not necessarily soul music, in the traditional sense, but just how devoted and involved, emotionally, that all four of us are, in our writing, in our performance, in what we do. It’s just a soul-baring experience, I think.” Says Anders Osborne. "Journeyman, Wanderer & Badass Musician"
Excited to announce Anders Osborne will be playing with Marc Broussard & Roy Durand at The Jefferson Street Pub in Lafayette August 7th! Pleased to announce Anders Osborne will be headlining Miami Valley Music Fest in Troy, OH August 1st-2nd. Excited to announce Anders Osborne will be performing at Great South Bay Music Festival, July 18th-20th at Shorefront Park in Patchogue, NY. Join Mother Plug Music at Avondale Brewing Company for an evening with Anders Osborne Thursday August 14th in Birmingham, AL. Anders Osborne performing "Jealous Love" from the album Three Free Amigos at The Bluebird Theater on May 30th via MoBoogie Vids! Interview with Anders Osborne previewing his upcoming headlining performance in Norfolk at the Bayou Boogaloo & Cajun Food Festival on Fri, June 20. He talks cover art, songwriting and his inspirations. A very big thanks to NolaVie for snapping some great photos of yesterdays performance at The Square in New Orleans. Check out the article for additional photos and set list! Live Stream Anders Shows at The Bluebird Theater and Burning Can Beer Festival! Not able to make it to the shows this weekend? No problem! Phoncert has you covered so you too can listen live! Make sure not to miss Anders Osborne at The Bluebird Theater tonight or at Burning Can Beer Festival tomorrow! Make sure to pick up your exclusive Anders Osborne New Orleans Jazz & Heritage Festival T-shirt's and Poster! These items are only available during Jazz Fest and won’t be available online, so don't forget to stop by the merch booth! Stream this weeks shows at Terrapin Crossroads! This weeks run starts tonight, March 12th and concludes on Phil Lesh’s birthday, Saturday, March 15th! The band features Anders Osborne, Joe Russo, keyboardist Adam MacDougall and other surprise guests! Greensky Bluegrass Opening May 1st Tipitinas! Just announced! Greensky Bluegrass to open Anders Osborne's May 1 show at Tipitina's! Rooster Walk - Martinsville, VA: May 22-25, 2014! From JamBase: "Review & Photos: Anders Osborne rocked NYC last night with special guests including Billy Iuso, Scott Metzger and Marco Benevento last night. Check out stunning photos and a full report..."
YLC Wednesday at the Square - June 4th! We're thrilled to be a part of the official soundtrack for Cinemax's Banshee with "Send Me A Friend"! Pick up the album on iTunes today or stream on The Hollywood Reporter! March 12th-15th @ Terrapin Crossroads with Phil Lesh & Friends! In celebration of Phil's upcoming birthday Terrapin Crossroads is throwing a big birthday bash this March! Anders Osborne with Phil Lesh & Friends will perform a 4-night runs in the Grate Room at TXR! The run kicks off on Wednesday, March 12th and concludes on Phil's birthday, Saturday, March 15th! The band for this run features Anders Osborne, Joe Russo, keyboardist Adam MacDougall and other surprise guests! Tickets for all shows are $79 except for Saturday, March 15th which is $100 per ticket. Tickets go on-sale Wednesday, February 5th at the Terrapin Crossroads box office beginning at 4:00PM and online Thursday, February 6th at: https://store.terrapincrossroads.net/store/tickets. Ticket limit is 4 tickets per customer, except on March 15th which is a 2 ticket limit per customer. These are ages 16 and over shows. Doors open at 7PM and showtime is 8PM each night. May 1, 2014 @ Tipitina's! Public on sale starts on Friday, February 7th. Atlanta - Anders Osborne is back in April for the 10th Anniversary of SweetWater 420 Festival! Head to http://sweetwater420fest.com/ for tickets and details. Anders wins four Offbeat Magazine BEST OF THE BEAT Awards – Best Rock Artist, Best Rock Album, Songwriter of the Year and Best Producer! Mountain Jam - June 8th! Anders Osborne at Mountain Jam Festival - June 8th!